I love clotted (or “Devonshire” or “Cornwall”) cream. I love it on fresh fruit. I love it on home-baked scones. I love it on… anything and everything. And would you believe this heavenly condiment is a cinch to make? All you need is a quart of heavy cream. I first encountered clotted cream in 1999, while visiting my dear friend Harold Brown at Kensington Palace in London. Harold was Princess Margaret’s butler. He had thoughtfully arranged afternoon tea in the Palace courtyard for the Silver Fox and me. I can still remember the smokey Lapsang Souchong tea, the Victoria Sponge Cake, and the small, round scones that we spread with strawberry jam and clotted cream. The clotted cream was a delicious dream. Its fresh dairy taste recalled ice cream — if ice cream could be served at room temperature! To start, obtain some heavy cream. For the best results, use only local cream from grass-fed cows. Do not use ultra-pasteurized cream — it won’t set up properly. Now, some recipe-writers will tell you to cover the baking dish with aluminum foil. This, however, is a terrible idea. The foil (or any kind of lid) will produce steam in the pan, and the final product will be runny. Well, this has been my experience after numerous, and very costly, experiments. Clotted cream should be so incredibly thick that a spoon will stand up in it. Now set the baking dish in a preheated, 180°F oven, and leave it there for 12 hours. During this time, the cream will develop a thick, almost leathery, yellow crust. Hint: Start this project early in the evening — or 12 hours before your normal wake-up time. 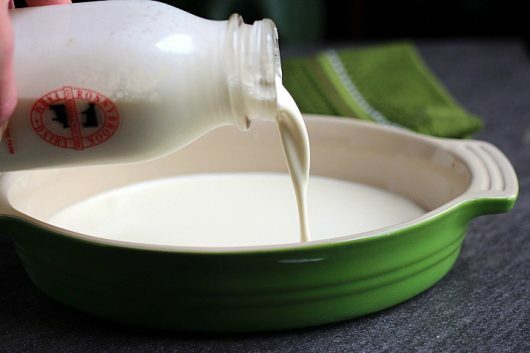 Let the cream cool to room-temperature — about 30 minutes — and then pop it into the fridge. At this time, you can cover the dish with plastic wrap. Let the cream chill until set — about 4 hours. 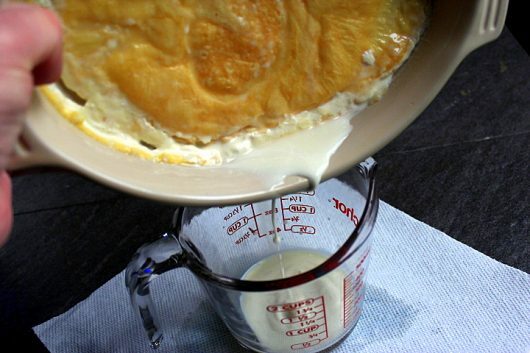 Now tilt the pan, and if you notice some uncurdled (i.e., still-liquid) cream in the bottom, just drain it into a cup. 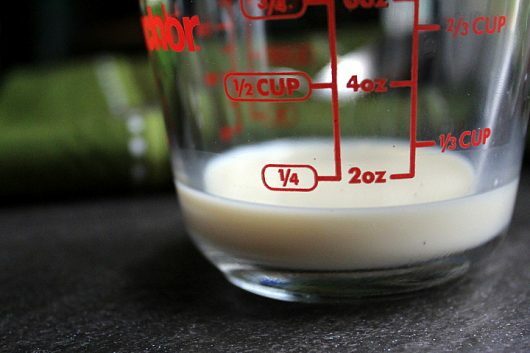 You can use this liquid for baking purposes, or just pour it into your coffee. I typically end up with less than 1/4 cup of drained liquid. Your mileage will vary, depending upon the quality of cream you use. And put it in a jar with a lid. 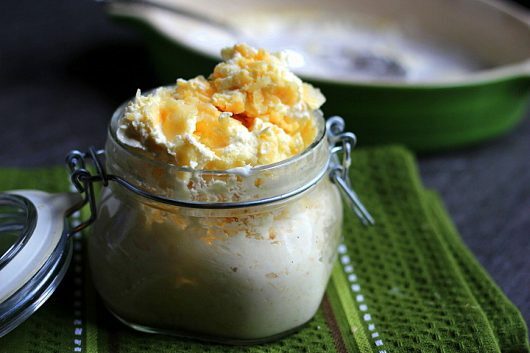 When refrigerated, clotted cream will remain fresh and wonderful for about 4 days. Well. I hope I’ve inspired you to make this clotted bliss. You can’t host a proper afternoon tea (a/k/a “cream tea”) party without it! Clotted cream is one of life's little pleasures. Serve this thick, rich, goodness on scones, on fruit, or whatever floats your boat! All you need is heavy cream with a high fat content. Center the oven rack and preheat the oven to 180°F. 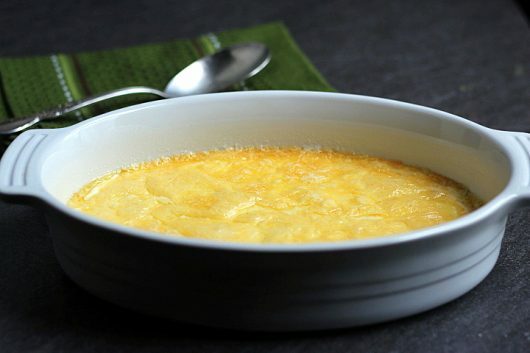 In a wide, shallow baking dish (gratin and casserole dishes work well), pour the cream to a depth of just under 1 inch. You can use more than one dish, depending on the amount of clotted cream you wish to make. Bake, uncovered, in the preheated oven until a thick, leathery, yellow crust develops -- 12 hours. Cool to room temperature (about 30 minutes). Cover the dish (or dishes) with plastic wrap, and chill in the fridge until set -- at least 4 hours. Tilt the dish to drain off some, if not all, of the excess liquid beneath the crust. Use the liquid for coffee or baking. Scrape the thick crust into a bowl or jar. Covered and refrigerated, clotted cream will stay fresh and wonderful for about 4 days. Serve it on scones, fresh fruit, or whatever floats your boat! Hungry for more? Get my email updates. Awesome! can’t wait to make it. never found a good way to make it myself before…. Thanks! Third use for the unclotted liquid cream: drink it immediately. That stuff in a jar not only isn’t the real deal, it also is so expensive it should be insured with Lloyd’s of London. This looks like the easiest thing in the world. No work at all. The only hard part would be maintaining patience for the long chilling/setting time. And the good thing about making it is you can eat the whole pot without making anyone think you’re a gauche American. I don’t comprehend the part about it keeping fresh in the fridge for 4 days. That’s like the lemon curd recipes that say it will keep in the fridge for two weeks. That always triggers a shriek of hilarious laughter. My refrigerator will never have to stress out over the heavy responsibility of keeping these delicacies fresh for more than a day. Now you need to give us a recipe for Devonshire cream. My husband is over the top with this. Thanks. Wow! I feel like a caul has been lifted from my visage!! I have always wondered what these British people did to make themselves seem so smart. Thanks! Wow! I fell like a caul has been lifted from my visage!! I have always wondered what these British people did to make themselves seem so smart. Thanks! This sounds like the old curds and whey my grandmother made only she gave any juice part to the little chickens to help them grow. They had their own cow, so the heavy cream was always fresh as we the milk, of course. 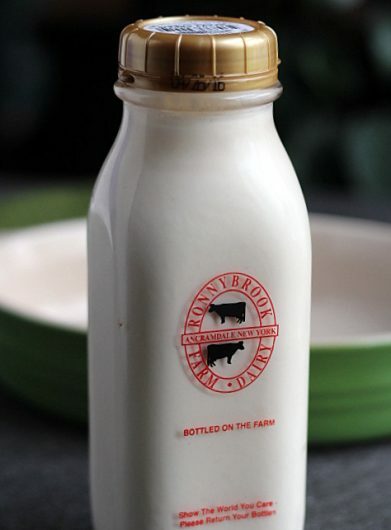 Their milk was never pasteurized, and they lived to the late 80 and 90 years old. Oh !my Scot genes are squealing with joyful anticipation! Hi Mary – Devonshire cream and Cornwall cream are, from what I’ve read, clotted cream. The names come from the areas in which they are produced. If you make clotted cream from dairy cows in your neck of the woods, by all means call it “Iowa Cream!” And yes, 4 days in the fridge? Hahaha. Mine doesn’t last more than 2 hours in this house! Oh I could just kiss you for this recipe !! Added to my recipe archive… waiting with bated breath for your cookbook. thanks, and I printed out the scone recipe. My son makes a very good scone too. His are gigantic. Your’s look perfect. never heard of clotted cream. we’ll try that. I love clotted cream, but haven’t had any forever because I was afraid to try it outside of Britain. Thanks, as always, for the recipe! Have you already given the recipe for scones??? Hi B Jordan – Click here for the recipe: English Cream Scones. Enjoy! Hi, Kevin – having l lived in the UK for a long time I’m quite familiar with the divine clotted cream; however, over there it was always white. I’ll check my UK recipes, since I don’t remember its having to be “baked”. I love clotted cream on scones and have only seen it at a local tea shop…but only in creamy white. Is the thick part traditional? I’ll bet it’s delicious. Hi Addie and Jeanne – Real clotted cream has a yellow crust. Not sure why the commercial version is all white. ALL your recipes are the best — so much so, I copy them and am surrounded by great piles of the precious things. I bake my scones with lots of currants, and naughtily ‘Americanize’ the tops with sparkling sugar. Fun! Only one ingredient ? It couldn’t be more simple, will have to try it. I agree with Mary, this won’t last at our house either = ) Enjoy reading the posts. Hi Addie B – I’ve read some of the recipes to which you refer, and they are for “mock” clotted cream. Hope you’ll give the real version a try. It’s simple to make, and again, just one ingredient! Hi Suznne K – Thanks for the link. Currants of all varieties are legal in New York. I have the white variety, Ribes ‘Blanca.’ The shrub requires no care whatsoever, and the berries are beautiful to behold and delicious to eat! Seems the most elegant of foods are often the simplest of ingredients + technique. Thank you Kevin for this great recipe. Do you know the difference between Cornish and Devonshire clotted cream? It is all in the construction of the toppings on the scone: Cornish people always spread the jam first and then spoon on the cream; Devonians spread the cream and then spoon on the jam! 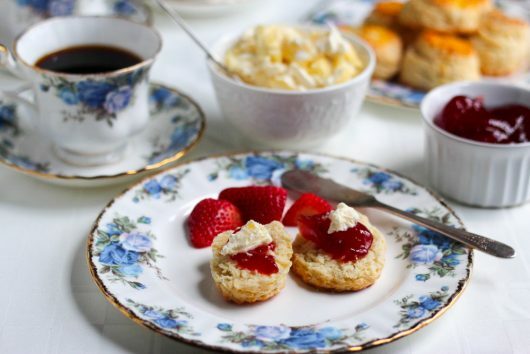 Just to be ornery, there is another great difference of opinion over scones in the British Isles – some say ‘scone’ as in own; while others swear by ‘scone’ as in on! The currants that are found in scones (not for purists) and other baking are not dried ribes fruits, they are dried Corinth grapes – small, black seedless grapes found in the Mediterranean area! Actually a raisin. 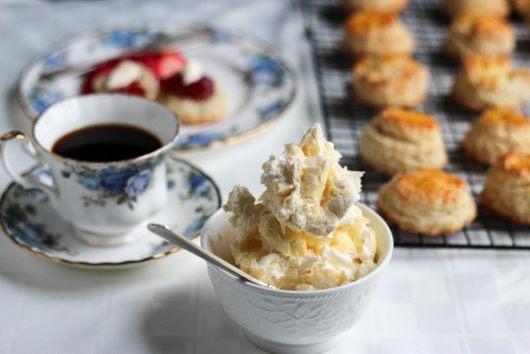 Years ago, TWA used to serve clotted cream and scones on the transatlantic route – I can recall the many times Americans would not touch the cream because it looked ‘off’! After all of that, your clotted cream is traditionally made, and looks delicious. I see you serve your cream scones Cornish style, jam first. Devonians put the cream on first and the jam on top. And don’t forget ladies and gentlemen —one’s pinky must be rigid pointing skyward at all times whilst sipping tea. 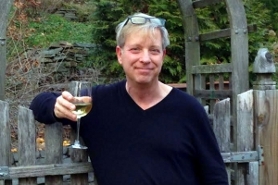 Hi Frederica and Alastair – Fascinating info — thank you! A-h-h, memories of “tea” in London. 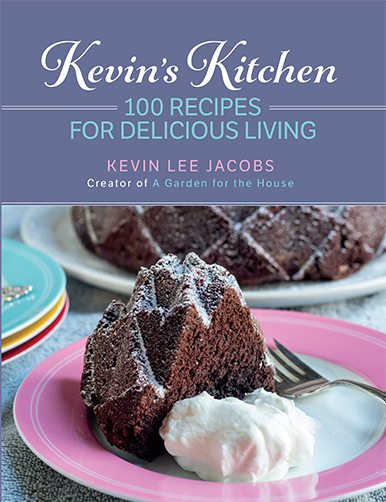 Thanks, Kevin – I’m sure I’ll give it a go – I was just a bit put off by the 12 hours in the oven 🙂 The recipes I found were quite good, but I know you’re a purist. And I’ll have a look at the NY currant info. As always, you’re a fount of information and a treasure! And thanks, Suzanne K for the info about back currants – I’ll certainly check that out! We learn something new everyday! Thanks Kevin! I lived in Scotland 4.5 years and had “tea” both there and in England and I never saw any yellow bits in the clotted cream. 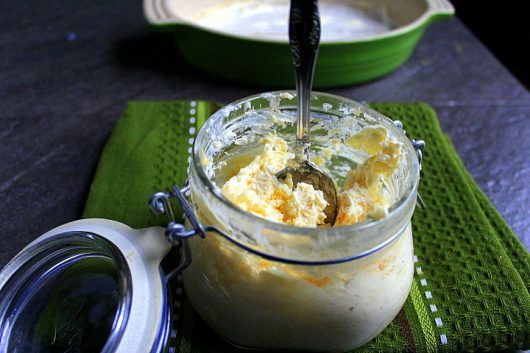 I have a recipe for imitation clotted cream which uses cream cheese, a bit of sugar and heavy cream. You just beat until stiff and it is quite good and keeps about the same length of time. Wonderful to have this recipe. Thanks so much. My Dad loved this stuff – had it at tea at Empress Hotel on Victoria Island…. LOL, Kevin. Yes, “Iowaish Cream” has a compelling ring to it. It’s bound to catch on internationally and be the coming rage among the world’s top chefs. Cornish clotted cream has the EU designation of origin business that Europeans set so much store by, and of which they are very protective. There is even a lot of anger that products made in the United States are being called “Parmesan”, Mozzarella”, “Prosciutto” etc. There is a movement in Europe to sue and force products made in areas other than the offically designated ones to be called “Parmesan-like product”, etc. I think the process for clotted cream may be different in the two areas of England. One baked, the other cooked over a double boiler sort of process. I like your oven process better since it eliminates tedious tending time. I’ll be making a trip to the Picket Fence Dairy Farm before making this. And soon! I’ve also had the “mock Devonshire cream” served at a hoity-toity tea party. It was actually very good, but quite a different thing. I love Devonshire cream, which in Devon and in London was softer and smoother than the Cornish clotted cream, which looked more like what you show. We found that style served only in Cornwall. I cannot buy anything BUT ultra-pasteurized cream, I am sorry to say. Seeing the references to Cornwall, I wonder if anyone would have a receipe for a Cornish hand pie. I ate them in northern Michigan many years ago. They were wonderful. Love to read all the comments. Lowest my oven will go is 200F. Is it possible to do this in a toaster oven? Or just shorten the baking time? Hey Blue Guy, I have made the mock Devonshire cream only because the recipe book stated that the real thing was very hard and involved. Well according to your recipe it is not hard it just takes time and I bet it’s worth every minute. Thanks so much. Note to Joyce Fowler: The hand pies you are asking about are called Cornish pasties. There are great recipes on line. There are a few areas of this country that actually make them in local bakeries, mainly northern Wisconsin and parts of Michigan where many Cornish immigrants settled in the last century. They are a mix of ground meat, potatoes, onions and the all-important rutabaga or turnips. Delicious. My family and I have very fond memories of a trip to the British Isles, when we spent a few weeks in Cornwall. At a great beach, St. Agnes Head, the snack cart sold a marvelous confection consisting of rich, local-made ice cream on a sugar cone, rolled in clotted cream, then chopped hazelnuts, with a Cadbury chocolate stick stuck in the top for good measure. I’m sure it was very low-calorie! Thank you for the clotted cream recipe! A scone is unfinished until it is added and I have been at a loss for it in the US!! I made it with raw milk and it was not as thick as yours but was quite tasty! I rebaked the thinner parts for another 8 hrs and it turned golden brown and is still delishious. Thank you for the recipes! I will be doing some baking this weekend!! Just curious, what is the brand of your tea set? It is beautiful! Hi Leora – Tea set is Royal Albert “Midnight Rose.” Enjoy your baking project! For American gas ovens that begin at 200F, try turning your oven on to 200 and wait until preheating begins, then slowly inch it to the blank spot to the left of the 200 mark. 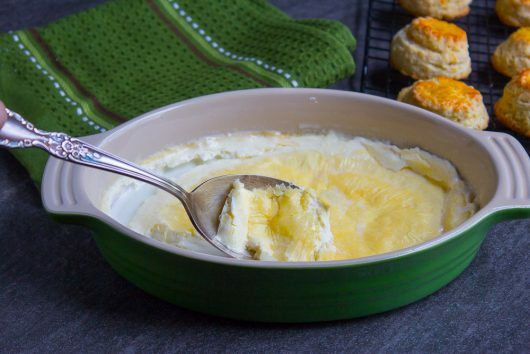 With a few seconds of adjustment and a digital thermometer probe left in the dish of cream, I got my temp to 176…12 hours later, I cooled the dish, popped it in the fridge for 4 hours, and scraped out the most gorgeous golden clotted cream ever. My daughter was repulsed by the crust, but after one bite, tried to run off with the whole jar!! Thank you. Hi Marya K – Thanks for the terrific oven-tip. Loved the story about your daughter! Hi Kevin, I love your blog. I have used so many of your ideas and recipes! Just wanted to tell you that I ran into … clotted cream when visiting friends in London. Homemade, yummy clotted cream, thanks for the recipe! I tried to listen to the directions, but I was a tad bit jet lagged and have wanted to make it ever since returning home. I trust you and your recipes! Hope you enjoy that beautiful white splendor in your yard as you enjoy the clotted cream that looks absolutely devine. I’ve made it by preheating the oven to 160 degrees C, put the cream in and shut the oven off. Let it sit undisturbed for 10 to 12 hours. Comes out very creamy..no yellow, no leathery texture. Key is shutting the oven off! Sorry..forgot to add…refrigerate it for 8 hours after taking it out of the oven.